Uncategorized Archives – P.O.P. Exhibits Inc.
Do you know that up until 2012 there were very few exhibit houses offering 2-Story Exhibits for sale and even fewer offering them as rentals. Much has changed and much has been written about Double Deck pros and cons over the last few years but as we get ready to enter 2019 let’s take a moment to review. Some of our clients rented a Double Deck and then decided to go back to renting a single level exhibit. One of the reasons for this has to do with weight, for the more an exhibit weighs the heavier the financial burden when it comes to the show imposed expense called Drayage. Multi-Story booth designs have to be structurally engineered so as to…. basically, be safe. This equates to more weight. Another reason might have to do with with space; if you’re able to secure a larger booth space you can spread out and negate the need for extra square footage upstairs. Marketing goals and the need for a different kind of presentation can play a role. Perhaps a large monitor and easily accessible seating are more important that a private conference area. Double Deck Exhibit Rentals continue to be popular, however, due to a number of positives. There’s the exclusive feeling you get when you are sitting upstairs and sharing that may help in building one on one relationships. It can be relatively open or completely private. The surrounding walls provide tons of branding space as well as visibility from around the hall. The bottom line is that they are impressive, solid, visible and strong. If this is how you like to think of your company perhaps it’s time to move up. Note: P.O.P. 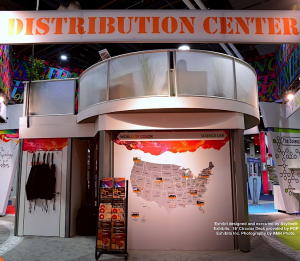 Exhibits Inc. has been offering decks since 2007.